Some room moments from this weekend, which, upon reflection, have proven to tell me more about the person I'm becoming than I had previously thought. I'll get real with y'all, I broke up with my first boyfriend back in January, and like most break-ups, it brought about an onslaught of serious, personal, inner considerations. I had a moment one morning about a week after the split when I realized that the first thing I was going to see in the morning was no longer going to be my Ex, but my walls. For the first time in basically ever, I started to take a long, good look at my surroundings as they were no longer obscured by big, blue eyes. This blog has helped me tremendously in helping me realize where my interests lie, but my physical space was something that I always kind of put on the back burner. As a kid, I was horribly unorganized and didn't give a second thought as to what my preferences were when it came to my surroundings as my mom designed my room layout for years before my parents split and she moved out. My dorm room at the New School was given a couple personal flourishes, but nothing that made me feel anything in particular. My room wasn't a home before, but now it's getting there. 1. My ever-growing collection of Instax mini photos, which are always taken during fleeting moments with friends. Their technical delicacy makes them even more special to me. 2. 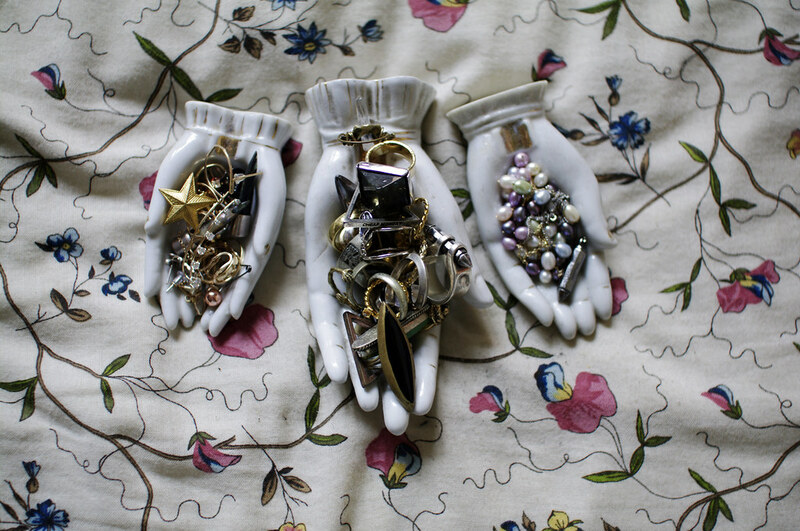 My collection of 20's cupped hand ashtrays, which hold all my favorite pieces of small jewelry. My mom started my interest in these porcelain ashtrays, which are so feminine and odd. Each of the three hold pieces that are associated with some sort of personal connection. The pieces I displayed here on the magazine are some of my favorite acquisitions I've made since I started blogging and collaborating with brands and designers I deeply admire like Annika from By Boe, Vanessa Mooney, Rebecca Zemans, and of course Lisa Salzer from Lulu Frost, who has given me my first step towards working in Fashion. 3. The giant, oversized rusty keys that my mom first hung in my childhood bedroom as a decorative way to contrast the girly-gingham design scheme she designed for me. Now they're a reminder of how much I admire and cherish her influence on my sensibilities. 4. My small, growing collection of records. The thing that makes vinyl so important to me is not really the whole retro-appreciation thing. It's more about making a decision to invest in a record that you can listen to and appreciate in its entirety, track by track. I only have about 12 (as compared to my parents' 200+ collection), but each fits a retrospective moment in my life. 5. My beauty routine has become significantly pared down. I've shifted my attention from my eyes to my skin, which has helped me feel more confident since it doesn't require too much trick of the hand. 6. My dad's hand--carved box which holds notes and tickets, and an antique perfume bottle given to me by my uncle sits on my side chest. They remind me of the strong, supportive family I have, and I have never felt so grateful to be in this moment of growing up. Who knew reading the ABC's could be so fun :) Loving the fashion font!! just recently went through my own breakup, and have found myself similarly introspective, looking at my life and my surroundings with new eyes. this is a beautiful idea, going through and capturing the things around you that remind you of who you are. beautifully shot and very evocative of who you are and who you're becoming.